Is transportation the new housing? Kyle Wingfield wrote a column discussing crony capitalism in the case of Fannie Mae that gave me an epiphany of where the next government created disaster will occur. Kyle’s column explored the idea that political elite of both political parties in the United States have been guilty of spending taxpayer money to benefit themselves, their friends and their supporters. Wingfield used Fannie Mae to point out that the crony capitalism inherent in our current political system is the driving force behind our nations rush toward bankruptcy and that the backlash to this unsustainable trend has given birth to the Tea Party movement. I suggest you read the whole column here. Fannie Mae co-opted relevant activist groups…. Fannie ginned up Astroturf lobbying campaigns…. A government entity co-opting activist groups, ginning up academic studies and spending tens of millions of taxpayer dollars to finance astroturf lobbying campaigns? Well that might have happened when Fannie Mae spent hundreds of millions creating a housing bubble that drove this nation into a depression…. but something like that couldn’t happen again. Could it? The U.S. Department of Transportation supports a network of University Transportation Centers throughout the nation to advance technology and expertise in transportation through combined efforts of research, education, and technology transfer. Within the federal SAFETEA-LU legislation, the Center for Transportation and Livable Systems (CTLS), formerly the Center for Transportation and Urban Planning, was designated the University of Connecticut’s University Transportation Center in August 2005. CTLS began its first year of operation in 2007 and since then has supported dozens of researchers and students through its research activities and helped inform the public and the scientific community in its workshops, seminars and symposia. begin accepting applications when announced in the Federal Register during the week of June 20. It seems everywhere I look there are indications that the federal government along with many state and local officials have begun the process of screwing up America’s transportation infrastructure the same way they managed to destroy the nation’s real estate industry. But it isn’t just politicians. It is also their cronies in the infrastructure and real estate development industries that are helping to create this mess. Georgia’s House speaker says leaders from his state need to sit down with Tennessee officials and discuss trading transportation enhancements for access to the water in the Tennessee River. During a recent radio interview with WABE-FM in Atlanta, Speaker David Ralston, R-Blue Ridge, said his state might be willing to offer improved rail, roads or other links between Chattanooga and Georgia air and sea ports in exchange for access to the river. Isn’t that special? Sure is funny how the push for inefficient and unbelievably expensive trains shows up in the oddest places. Between the early 1990’s and 2008 the federal government along with willing accomplices at the state and local level worked hand in hand with banks, governmental agencies, developers, builders, land speculators and a host of other cronies to create a real estate bubble that has staggered this country. In the process a lot of people made a lot of money at the taxpayers’ expense. I see many of the same people doing almost the exact same thing now. The only difference is that now they are salivating over the billions of dollars to be made from creating a transportation bubble. So the question I leave you with is this: Is transportation the new housing? A new Brookings Institution report provides an unprecedented glimpse into the lack of potential for transit to make a more meaningful contribution to mobility in the nation’s metropolitan areas. … according to Brookings, only seven percent of jobs in the nation’s largest metropolitan areas can be reached by residents in 45 minutes during the morning peak period (when transit service is the most intense). Among the 29 metropolitan areas with more than 2,000,000 population, the 45 minute job access average was 5.6 percent, ranging from 12.6 percent in Boston to 1.3 percent in Riverside-San Bernardino. The New York metropolitan area’s 45 minute job access figure was 9.8 percent (Figure 1). 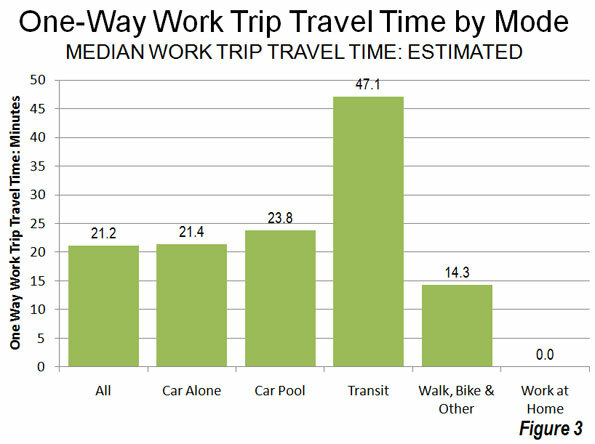 Transit’s overall median work trip travel time was more than double that of driving alone (Figure 3). 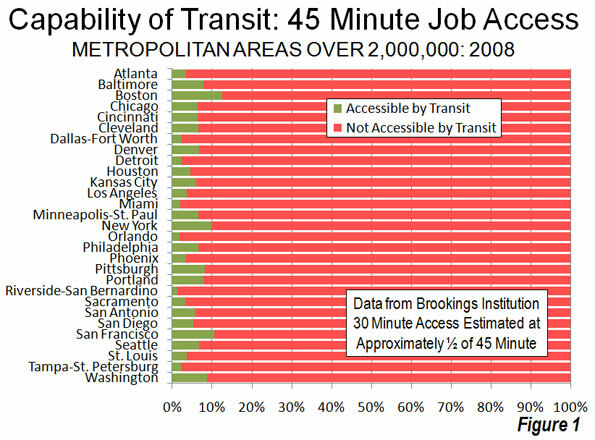 More money cannot significantly increase transit access to jobs. Since 1980, transit spending (inflation adjusted) has risen five times as fast as transit ridership. A modest goal of doubling 30 minute job access to between 6 and 8 percent would require much more than double the $50 billion being spent on transit today. Moreover, there is no point to pretending that traffic will get so bad that people will abandon their cars for transit (they haven’t anywhere) or that high gas prices will force people to switch to transit. No one switches to transit for trips to places transit doesn’t go or where it takes too long. There is a great deal of information I have not included here so please read the entire article to understand the context before drawing any conclusions for yourself. But the fact remains that there are volumes of evidence showing transit is not a practical solution to Atlanta’s traffic problems yet many of our area’s transportation decision makers choose to ignore those facts. Even with a transit system subsidized by billions of dollars each year in a metropolitan area as dense as New York City there are fewer than 10% of the residents that can get to work on transit in less than 45 minutes. That isn’t a solution it is a problem. Lately there has been a great deal of talk about the need to bring mass transit trains to and through our fair city of Alpharetta. I previously explained here how the Mayor of Johns Creek advocated the urbanization of Alpharetta because he feels that his constituents are underserved by MARTA. I also showed you how the rainmaker for the local chamber of commerce is pushing a train system that would run through my neighborhood to serve residents in Johns Creek and Duluth. I personally abhor taxpayer subsidized trains because I believe they waste money on an inflexible and inefficient transportation system. I won’t rehash my reasons for this position now but you can click on the transportation tag to the right of your screen for more background. But for the sake of argument let us assume that trains will be built to serve Johns Creek and Duluth. 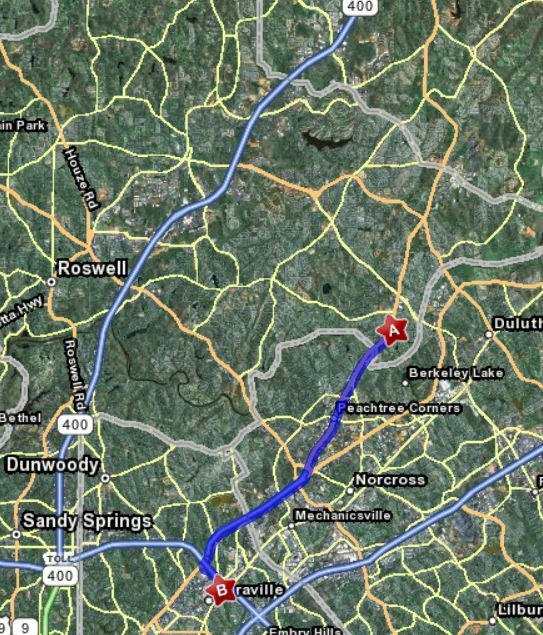 The question then becomes, “Why go through Alpharetta to get to Duluth when there is a much more intelligent and economical solution to extending trains into North Fulton and Gwinnett counties.” Below is a proposed path for a MARTA rail extension that would only require about 10 miles of rail as opposed to the 30 necessary for the plan currently being suggested. The route shown above requires only 10 miles of new rail lines which is 1/3rd of what would be required for the plan proposed by DOT board member and Chamber of Commerce CEO Brandon Beach. Not only would this route save BILLIONS of dollars but it could be completed in a fraction of the time. That is a tremendous amount of time and money that could be better spent making other much needed infrastructure improvements. In addition to saving Georgia taxpayers time and money my proposal is also superior to the one being floated by Mr. Beach because it would relieve traffic congestion on both I-85 and GA 400 simultaneously. If you extend MARTA along GA 400 it would only relieve congestion along one existing main artery but by placing a train between two of the most congested highways in Atlanta we could actually double the impact for one third of the cost. So as you can clearly see, if we decide to expand rail into North Fulton and North Gwinnett then the obvious way to do it would be to extend the Doraville line up the Hwy 141 corridor. And since the solution is so obvious I hope Mayor Bodker will immediately begin pushing land use policies for Johns Creek to help facilitate this important regional initiative. Undoubtedly Mayor Bodker’s constituents will be thrilled with his vision and leadership on this matter.